Last Saturday, T-bone, David, and I took a 13hr “rapid express” train ride to Chiang Mai, where we would pick up the boats and gear for our 6-day paddling trip. All of us had previous paddling and camping experience, but none of us had done anything like this in Thailand. It was during new teacher orientation in July that we first started tossing around the idea of a trip – we discovered that David was a fellow adventure-lovin’ soul, and the three of us talked about an off-the-beaten track trip for months. We had a brief vision of buying a fisherman’s boat on a random river and just going, but it turns out that none of us could stomach the thought of being stranded because a hypothetical fisherman wouldn’t sell us his hypothetical boat. Plus, it turns out that the only half-decent, semi-current maps of Thai rivers are written in Russian – not great for navigating rapids. It became obvious that we needed something a little more structured, so we Todd started emailing rental companies. Turns out that most companies are strangely disinterested in renting boats to groups of randoms when they could be raking in the cash from guided tours. It wasn’t until we contacted a swashbuckling expat named Aidan that we saw any hope on the horizon. We pinned all our paddling hopes and dreams on his rental company, Chiang Mai Kayaking. Aidan had never rented gear to independent trippers before, but he must have liked the look of Todd and his wives, because he agreed to supply us with boats, dry bags, a GPS, and transportation. He mapped out a section of the Mae Taeng river for us. 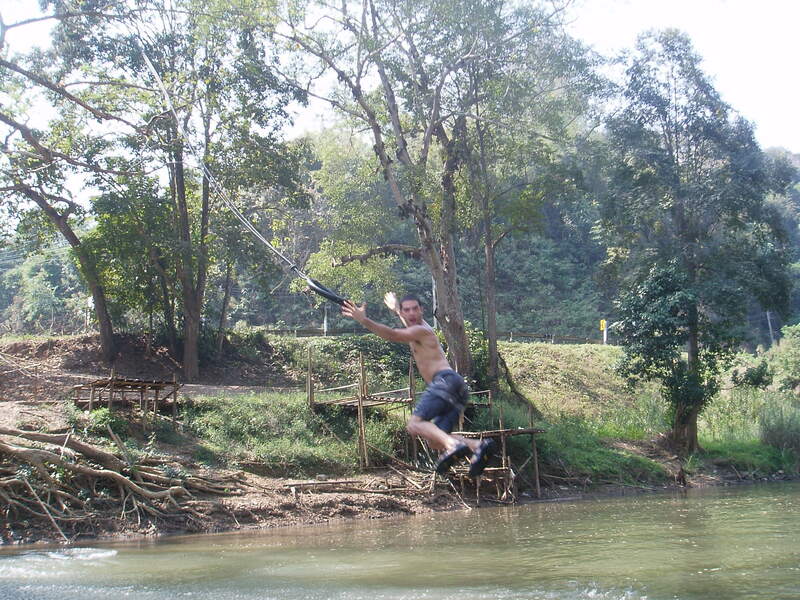 The Mae Taeng flows into the Mae Ping, which runs through Chiang Mai, and our put in point was located approximately 150 km north of Chiang Mai. Aidan wanted to observe our paddling skills and make ensure that we safely got past a military compound (“don’t ruin my business by getting shot at”), so we spent the first afternoon paddling with his guided tour group. The stretch of river wound through the jungle, and though the water level was low, there were some fun features to navigate. Once we had left the military base far behind, Aidan said “bon voyage,” and sent us on our way. David promptly used his new found freedom to jump off a tire swing into a foot of water with a group of intoxicated Thai gentlemen. The stretch of river that we paddled alternated between dense jungle and farmland. The jungle tended to have more interesting features and swift flowing sections. It was fun in low water, but in high water, it would definitely be challenging. The farmland sections tended to be slow moving, and at times, a little dull. It was neat to observe the various farms, fishermen, and farm animals, but I kinda hate flat water. The cattle were a little baffled by us. There were several dams and quite a few bridges on the route. Other than a few annoying portages, neither represented much of a paddling challenge, but they served as a constant reminder that we hadn’t really left civilization behind. We were struck by how populated the area was. I think we all naively hoped that we would experience some “real” wilderness, but even in the jungle, we were never really alone. One of the biggest water hazards were the diving fishermen – you never knew when one was going to pop up, wearing only goggles’n’ginch. We had a motley assortment of gear going into this trip, to put it politely. Neither we nor David had brought much equipment from home, so we had to mooch some gear from friends, buy other bits, and simply go without. We bought hideous army print sleeping pads from a tourist trap, borrowed a tent from friends (abundant thanks to Josh and Jaime for saving us from spooning with Country Wife David in a 2 man tent), and discovered why flip-flops should never be worn on a paddling trip. It was a strangely liberating experience. Trying to downsize, with mixed success. While we brought our entire trip’s worth of food with us, we discovered that it was possible to buy supplies along the way. We bought vegetables and fruit several times, which made the packaged sauces much more palatable. We were also able to purchase water along the way, which saved us from filtering the sediment-rich jungle sludge. This was a huge bonus, considering that our back-up water plan was a charcoal “emergency filter” straw. And the banana flower back-up plan didn’t work out so well. We camped on a motley assortment of river banks, most of them in view of a farm. Being so close to civilization was an interesting experience, and led to some unique encounters. On our first night, we heard gunshots in the very near distance, and I convinced myself that someone was taking pot shots at our fire. On our third morning, we were awoken to the sound of two mahouts (elephant trainers) riding elephants through the river next to our camp. On our fourth night, the friendly folks across the river insisted on giving us huge pieces of hardwood for our campfire. And on the last night, we camped along an irrigation canal, and listened to the voices of chanting monks interspersed with horribly off-key karaoke music. 6 days later, Buccaneer Aidan picked us up at one of the most scenic dams I have ever seen. Wearing exactly the same clothes as the first day! 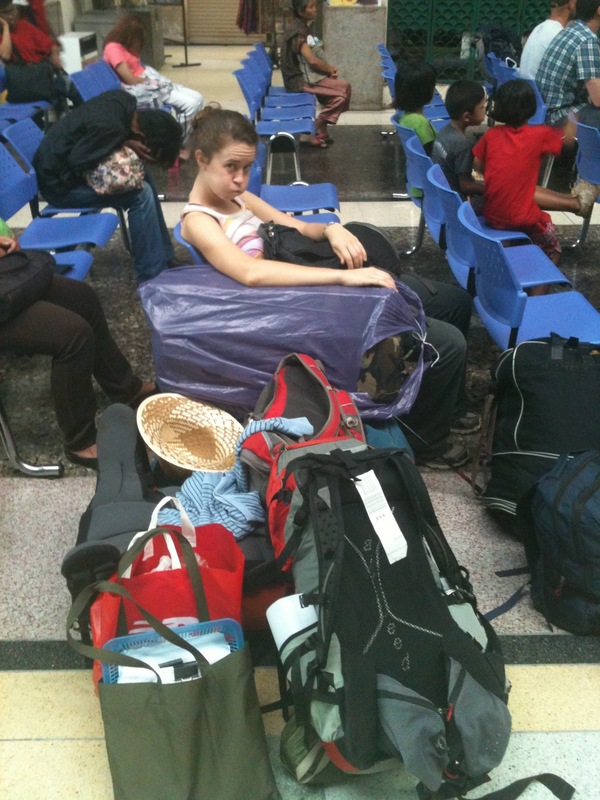 After loading our gear, boats, and filthy bodies into Aidan’s truck, we headed back to Chiang Mai. An awesome perk of tripping in Thailand are the cheap massages you can get afterwards. The masseuses made the interesting decision to put a curtain around my mat, while leaving Todd and David to enjoy a couples massage. I guess the Country Wife aura still lingers. I also got a pedicure – and yes, I gave the salon an exorbitant tip for dealing with my filthy feet. And finally, there was nothing left to do but mow down on some Mexican food, and enjoy a heinous bus ride back to Bangkok. We’re about to embark on our one week kayaking trip – just enjoying one last breakfast and googling “does Thailand have wild crocodiles?” Whatever the answer to that question, we’re about to be dumped at the side of a strange river with a random assortment of gear that we scrounged from teachers, students, market vendors and 7/11. It’s gonna be good. I’ll be out of blogging range for the next week, and I’m looking forward to sharing our adventures with you when we get back. If we get back. (I’m joking, Mama Jan).